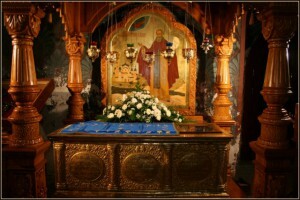 The main shrine of the monastery - the reliquary of St. Joseph. The holy relics were found in 2001, before that they were under a bushel. Every Sunday evening service at St Joseph of the Akathist to read, after which all have the opportunity to venerate the relics open. In this case, everybody is either incomparable scent of fair remains saint. The relics of St. JosephThe main shrine of the monastery - the reliquary of St. Joseph. The holy relics were found in 2001, before that they were under a bushel. Every Sunday evening service at St Joseph of the Akathist to read, after which all have the opportunity to venerate the relics open. In this case, everybody is either incomparable scent of fair remains saint. When in 2001-2003 the Russian Center staff forensic Health Ministry performs the identification of the holy relics, the scientists found in the collarbone Reverend dents - that is, during the lifetime of his bones under the weight of the chains deformed. Thus, the chains are stored in the monastery is a silent witness of monastic efforts of the founder of the monastery. plate.These chains Rev. Joseph worn under clothing without having to remove and found them after his death, when the body was prepared for burial. The total weight of the chains about 15 pounds. The original icon of the XVI century, was taken from the monastery in 1954. In 1959, the icon was restored V. Bryagin and since then is in the collection of the Central Museum of Ancient Russian Culture and Art Andrei Rublev. March 16, 2007 was brought to the monastery icon, written "to the extent and kind of" ancient form the Moscow iconographer S. Fomin. We can say that the new icon received a blessing from his old: before it took place in the cathedral church of the monastery, its consecrated at the Museum of Andrei Rublev and was applied to the miraculous image of the XVI century.